WD-40's Management Slowly Backs Away From Its Goals. Is This Stock Still a Buy? Management's comments about WD-40's long-term goals for revenue could change how investors view this stock. 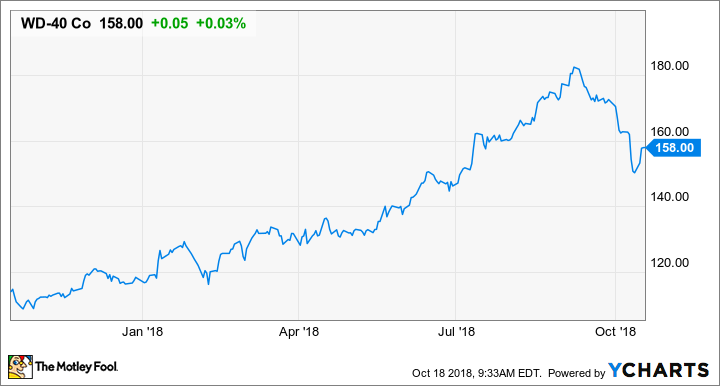 WD-40 Company (NASDAQ:WDFC) has always had a long-term vision for the business, as evidenced by the strategic goals laid out in its investor presentations, which strive for $700 million in annual earnings by 2025. With revenue growth coming in slower than the pace needed to achieve that goal, though, management is now starting to make statements that make this goal more aspirational than a hard target. That suggests that perhaps the company's growth isn't going to be as good as originally anticipated. If so, should that alter the way investors should look at this stock? Let's take a look at WD-40's most recent earnings results to see if this stock is still a buy today. The two things that pop out in WD-40's earnings this past quarter is the slight decline in revenue from the prior quarter and the significant jump in earnings. Management noted it wasn't too concerned about this because there are some factors that can make its sales numbers a little lumpy, such as promotional deals and the timing of customer orders. It's worth noting that sales were up year over year. The jump in earnings does look a little out of place, especially since it is higher than operating income for the quarter. That's the result of a one-time $7.1 million tax adjustment associated with the recent round of tax cuts. Absent that gain, WD-40 recorded earnings per share of $1.03. With this being the end of the fiscal year, CFO Jay Rembolt issued guidance for the 2019 fiscal year. [W]e expect net sales growth projected to be between 4% and 7% with net sales expected to be between $425 million and $437 million. Gross margin for the full year is expected to be near 55%. Advertising and promotion investment is projected to be between 5.5% and 6% of net sales. And the provision for income tax is expected to be between 21% and 22% of sales. Net income is projected to be between $62.2 million and $63.2 million. And diluted earnings per share is expected to be between $4.51 and $4.58 based on an estimated 13.8 million weighted average shares outstanding. Stripping out that one-time tax benefit, the company is guiding for another year of steady growth. That growth rate, though, is a little too slow for management to meet its long-term revenue targets. On the call, CEO Garry Ridge even made comments to hedge against the possibility that it might fall short of its goals. As most of you will recall our long-term revenue target is to drive consolidated net sales to approximately $700 million in revenue by the end of fiscal year 2025, and to do so while following our 55/30/25 business model. We'd like to remind investors that these long-term targets are guideposts, not guidance. We acknowledge that our anticipated 2025 targets are aspirational. But we continue to believe that if we stay focused, we can be successful in moving toward these targets. Note: WD40's 55/30/25 business model means 55% gross margins, 30% cost of doing business, and a 25% EBITDA margin. WD-40's 2025 revenue target has been a North Star for management for at least a couple of years now, but the current pace of revenue growth and its 2019 revenue guidance of 4% to 7% are making that target less achievable by the day. Ridge is even admitting now that this goal may not be attainable. Guidance for this year and next doesn't change the fact that this is a great business to own over the long term. WD-40 is a strong brand that's in a defensive consumer segment that won't fluctuate much with the economic cycle. It has a low-cost structure and requires minimal capital investment, which results in high rates of returns. Businesses like this are ones you want to hold in your portfolio for years and years. That said, WD-40s stock looks incredibly expensive right now. Based on management's guidance, the stock is currently trading for 35-36 times 2019 earnings. That is a hefty premium for a stock that is likely going to grow in the mid to high single-digit range for the foreseeable future. While it's worth keeping WD-40 on a watch list, it may not be the best time to buy this stock.